We are scheduled for a 10:00 AM local time start. We are looking outside once again and we don't see snow. What a relief. We will be heading over to the courses shortly. See you there. Ok, it isn't any warmer at the event site than it was walking out of our hotel. We were hoping anyway. Currently the skies are threatening, but they aren't dropping anything on us yet. Also, it feels colder today so is snow eminent? It was scheduled to be a 10:00 AM (Utah time) start, but the drivers are still out walking the courses and getting ready in their minds how they want to drive the courses. The spectators are rolling in pretty good despite the weather conditions and they are all better prepped wth warmer and dryer clothes. The day just seems longer when you are cold and wet. As you can in the scores, that battle for the top spot is currently between the two Jasons. Jason Paule is out in the lead currently with -9 points. Jason Scherer is following closely behind with -6 points. Looking at their scores, they were swapping points back and forth througout the day. 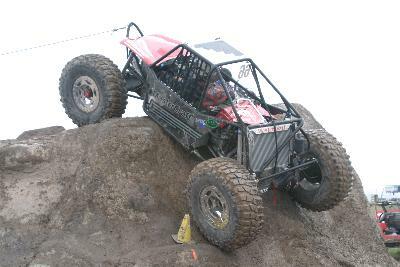 Can Paule bring home a first event win with his front engined rig? Will Scherer take his newly owned Tiny to the podium giving the rear engine boys something to gloat about? Or will we see someone sneak in from behind and spank them both? What about those Modifieds? 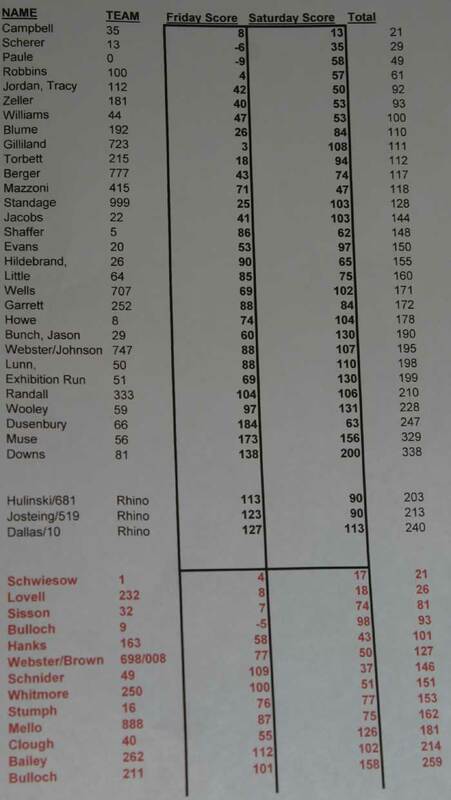 It seems as though Dean Bulloch has his game in the pocket once again as he tackles the score barrier and is the only Mod guy in the negative points. He is holding onto a -5 points at the moment. I am sure Joachim and Brian in the #001 buggy have a game plan to make up the points they lack and then some. They are sitting with 4 points. Just shy of them are the Lovell brothers. It's going to be good racing, so lets get it on. Somebody start this thing!! I can't wait. We are racing!! Right out of the gate, we have action. Becca Webster is over on course #1, Dave (DSI) is on course #2), Pete and Nick are on #4, and they are all going for it hard. Becca started out of the gate charging the wall hard. She was the first to ever summit the big Horn and she is back at it again today. Her first attempt on it got her stuck at the top with all 4 tires spinning. No matter what she tried, she just couldn't unstick it. She was then forced to back it down and give it another go. The second attempt worked out much better for her as she peaked it over with more throttle. Dave on course #2 looks to be doing ok at this point midway. He had a few backs and the drop in was a success. Lets see if he can make the bonus line. Before the event, Dave was confident that the bonus could be made. He did it in his old rig and felt that this rig should have the ability as well. Dave, spotted by Trever from S&N fab, are going to give it their all. It appears as though they weren't able to make the bonus line, but they did grab 19 points for the course. When speaking to Dave and Trevor, one thing that they need to do is tape Dave's shoe to the gas pedal. It's slippery out here and not just on the ground. Aaron and Jason in the #66 MasterCraft sponsored buggy, had some mechanical issues yesterday, which took them out of contention for top spot. A lot of late night work and they got the newly built crawler here for todays running. However, they do have a problem with the ARB differential working intermittently which will make today a nightmare. If you aren't spinning all fours, you aren't going to get through these courses. They are looking okay though right now on course #4. The locker appears to be working, but that isn't helping them with the cones that they hit. As they worked their way through the course, they tried to burn the rear end down for a position and wouldn't you know it, the locker appeared to fail on them. They were stuck doing a single wheel dig which wasn't too useful in getting to where they needed to go. In the end the course beat them down to a 35 point score. Better than 40, but not what they wanted to see on their card. Meanwhile, Peter and Frank Wells in the #707 sprint car looking crawler are smoking up the #5 course. I lost site of them as they disappeared into the cloud of white smoke. On this course, there is a hot tub like obstacle that they have to drive through. Its steep and deep to get in out of which has caused problems to more than oe team this weekend. To add to the challenge, the pit is filled with all the rain water from these last few days. Pete got into that hole and tried to smoke his way out of it, but something let go as the sky was filled with white clouds. Sinfully, the rig let go and couldn't get out of the pit. He was forced to end the course early and get a pull from a tow truck. 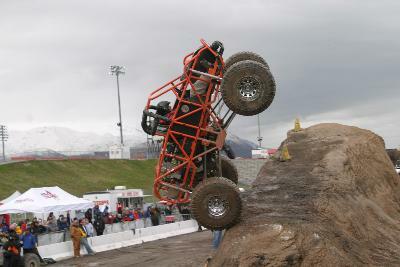 Parker Garrett, in the #252 crawler, just made one of the most AMAZING roll over drive outs. He was literally on his side with the underbelly nearly facing the sky. 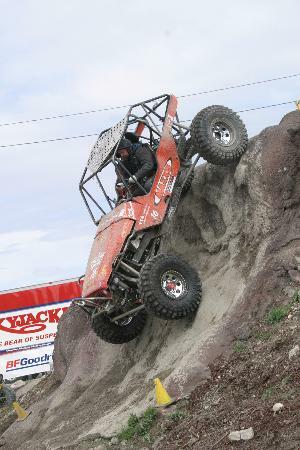 He worked the rig slowly in the crevice and actually drove it back to its wheels to finish the course. From here though, it looked like he was leaking something which may have cost him some points. 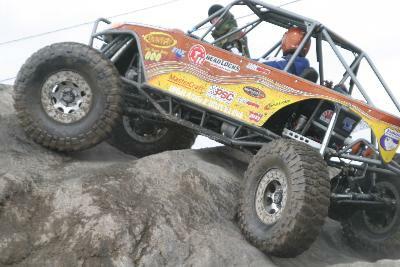 Ken Blume is back again this year in the Pro class with his unique, portal axled single seater rig. It's a front engine design with high clearance portal axles that both steer. This is a new feature for him this season which will hopefully help him more than hurt him. Ken was just on course #5 which was their first for the day They left yesterday in 8th place and are looking to make up some of those points. With only 5 points on their first run, they are looking good to make good on their efforts. Do you know what the Rhino class is? You may have seen them in the score sheet. This is a special class that was created just for the Rhino rigs. 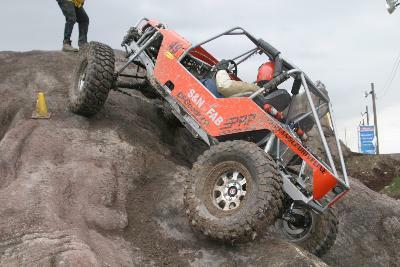 These rigs are designed to be an all around vehicle and an entry level rock crawler. There are actually 3 of them driving here today and they are putting on a good show for the crowd with their hammer down style driving. They aren't afraid to push their vehicles. Parker Garrett in the #252 rig was on course #1 taking on the hill which wasn't too friendly too him at SuperCrawl. Parker wound up rolling at SuperCrawl which gave him a concussion and sent him to the hospital. This time, Parker made a successful launch over the hill and was happy to see the other side. So happy that he attempted the other side. His attempt was short for when his front end went into the air and slammed back down, the compression of the front broke something in the engine bay. It wasn't clear at first, but it appears that they sprung a leak on the cooling system. Just in front of us, Sisson team #32, were trying to get over the last wall climb. Once over the top they were precariously leaned over and on the verge of rolling. I thought they were going to pull it off, but they wound up rolling into the same crack that Randy Torbett rolled into yesterday which created a long extraction time. It's been 5 minutes now and the rig is still upside down now. Parker Garrett in the #252 rig was on course #1 taking on the hill which wasn't too friendly too him at SuperCrawl. Parker wound up rolling at SuperCrawl which gave him a concussion and sent him to the hospital. This time, Parker made a successful launch over the hill and was happy to see the other side. So happy that he attempted the other side. His attempt was short for when his front end went into the air and slammed back down, the compression of the front broke something in the engine bay. It wasn't clear at first, but it appears that they sprung a leak on the cooling system. Despite the destruction, their end score was -16. Dean and Karl, in the #009 rig, may have hurt their chances for the win today depending on what broke. Dean was attempting to head over the wall on the Matterhorn making several runs at it. . One after another they were powering oh so close to the top but lacking the motivation to get it done. Then out of nowhere, on the way up, a loud bang rang out across the crowd which always signals bad news. It appears as though the rear end let go on the rig while trying to power up and over. Dean was first coming into today and it won't take much to get bumped out of it. 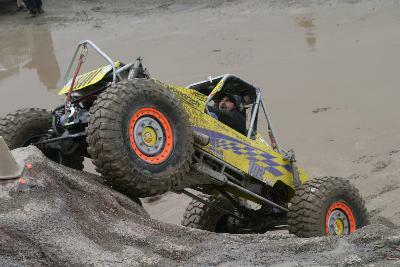 Craig Stumph in his newest crawler was having tough luck on course #2. He got a 40 when he wasn't able to complete the course. His spotter just commented that it was a shame. They were so close, but so far from. The weather has cleared up here at the site as well. The sun is somewhat out right now and we are enjoying the moments while we can. In the meantime, scores have been updated to the site. 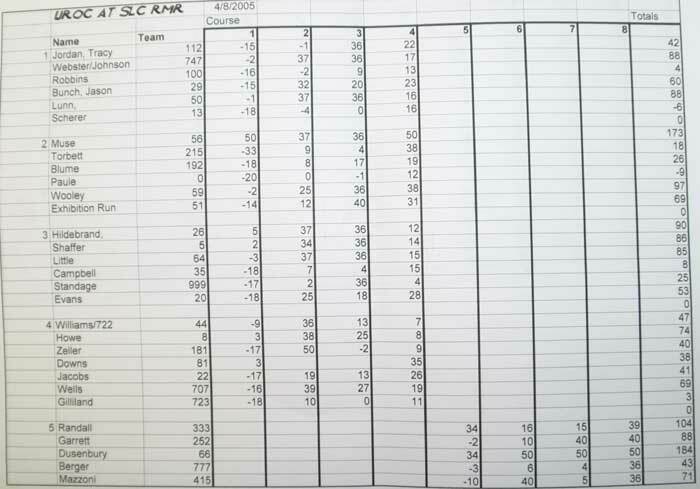 You will notice that UROC doesn't have both days scores on one page, so you will have to do the math from home until we combine them at the end of the day. A link to the scores are at the top of the page. Jason Paule, the SuperMod leader just pointed out on course #8. He had problems hitting cones and even more trouble with the bump hill. He got a little sideways through the climb and took a cone along the way. He eventually made it to the top, but the damage was already done. A 35 point score will drag him way down... but how far? Will Jason Scherer jump into his position? This is getting interesting. We will be getting scores shortly and be able to see where everyone is at. We are getting close to the end of this event and the SuperMods have heated up big time. The battle appears to be between Shannon Campbell and Jason Scherer. Jason only has one more course to go and we will talk to him once he is done. On the Mod side, Lovell has stayed consistant so far and is retaining good scores. Joachim and Dean both had some hard luck runs which pushed them back in points. Joachim will be able to remove some of those points if he makes it over the wall. The Lovells will have to make a good misake to lose the lead thus far. How exciting!!! Joachim and Brian in the #001 Modified buggy just did a ride along on the #1 course to get a bonus. They launched over the top of the Horn and that will get rid of some of those penalties from earlier. They were looking at the backside wall, but have chose to call it. This will definitely tighten up the points race and maybe push them ahead. The scores were just updated. The link to the scores are at the top. While we watch the last of the rigs running on the courses, we caught up with Peter Wells of the #707 rig out of Colorado. They were having a mixed day. When I say mixed, they would have a good run killed by bad luck. For example, ealier he was on course #5 and was pulled out of it by a tow rig. They were actually aceing the course and running it pretty well. They would have scored really low, but the tub took out their front axle shaft. Pete said, "We've done pretty good so far, but we broke an axle in the pit. We were doing a front dig and it just broke. Our last course will be the "Cone Fest" over on #8. Nobody is doing really well over there today. I really don't like the technical courses since my rig is really wide." Jeff Mello had a mean sounding run going on course #4. The uurgling tone of the motor sounded wiched as he struggled for traction to get over the wall. He wiggled back and forth hunting for that forward motion when finally hooked up and pushed over. A spill of fluid was called though by the judge which knocked him 10 points. He raced the remainder of the course in quick time which was exciting to watch. In the end, he pulled a 31 points for the course. We are still waiting for the scores to make their way back to us so we can see who the winners are. There are still rigs on course so it may be a little bit before we get the true scores. Most importantly I want to thank Dana, my fiancée, for all the support she has given to us. She feeds the team and supports all our activities. Rock crawling is our daily life and she supports us every step of the way. Whether they take first, second, third or last. Jason and his team always have a smile and are ready for more. Rock Crawling seems to be in Jason’s blood because he just can’t seem to get enough not matter how bad things get. If there is a true appreciative competitor out on the field, Jason seems to be it. Good luck to Jason as we wait for the final runs to go through. Dean Bulloch just finished his last run, so we should have his scores coming soon too. Shannon Campbell just did a great job on #5 so now it is really a tough call to whom may have won this weekend. Well it is semi-official. Joachim and Brian, #001 rig, appear to have taken the win with Brad and Roger Lovell #232 rig taking second place. It was a close call all the way down to the last run. The only way the Lovells could have caught back up was with a run up the bonus line on course #2. They made a couple attempts at it, but time ran out. On the SuperMod side, Shannon had such a clean run today that it looks like he took first with Jason Scherer followed closely behind him. It is all speculation at this point since there isn't a score up for them, but it appears to be this way. Course #5 and #8 are still going, so they won't be posting final scores till a little later. The latest score postings are up. Make sure to refresh your browser to see them. 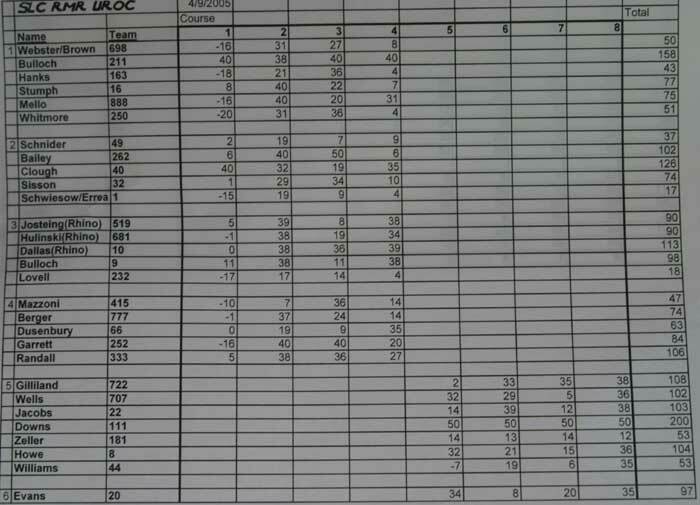 The unofficial final points for the courses are listed. The only one that is questionable is Bailey's 50 since the scorecard appeared incorrect. Therefore, his score may change a little bit. You have been notified even before the drivers. Congrats to Shannon Campbell and Joachim Schweisow for winning their classes. Great job.!!! Well the day is officially over and the winners have been crowned their trophies and checks. It was a great start to the Pro Season to come. It had its ups and downs, but ultimately in the end, the event was filled with wild action that was fun to follow. There is nothing like having an event come down to mere points separating teams. I look forward to the next one. All of the pictures from the event are now up in the gallery. We wound up ending our day with many of the drivers and sponsors of todays event. 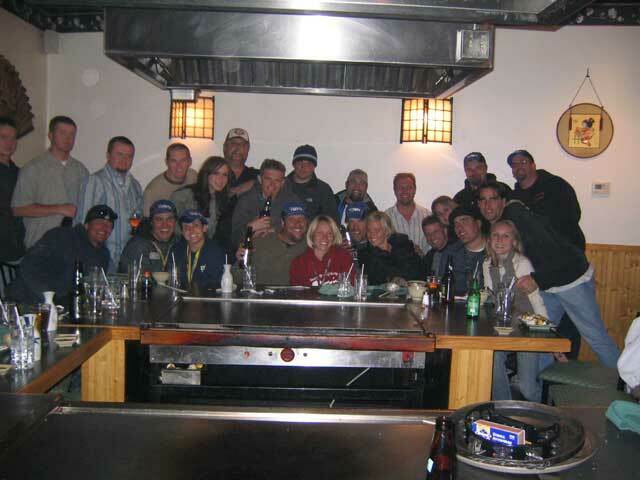 We spent dinner with the gang from Pirate4x4, Shaffers Off-Road, Toyo Tires, and Outer Limit Motorsports. You can't have one of these events without going out and partying afterwards. I can't remember one event where we didn't go out and cause a little trouble on the town. This time was no different as we crashed a Japanese grill.